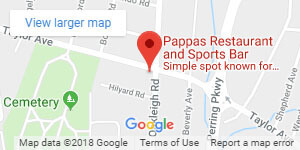 Since 1972, when the first Pappas’ Famous Crab Cake was born, this secret recipe has remained unchanged and well guarded by the Pappas Family. You are about to enjoy the result, a true gem of Baltimore: the BEST crab cake in Maryland! Our diverse menu includes something for everyone! Fresh seafood and beef, pasta specialties, chicken, lamb and veal, soups, salads and sandwiches.. plus a full children’s menu! In addition to the original restaurant location in Parkville, be sure to visit our other locations in Glen Burnie and Cockeysville, and our carry-out Seafood Market specializing in fresh fish and steamed crabs in Parkville!